With football looming (first game is thursday, all other teams start a week from today), I figured it was about time to crank out the rest of my fantasy football previews. Most of you have probably had your drafts already (unless you’re total slackers), but these previews can be useful all year long, so I’ll keep on keeping on for you readers. The Chargers are the favorites to win this division every year. Last year, injuries and Vincent Jackson’s hold out caused them to come up a little short. This team is healthy now, and if they stay healthy, I can’t see not picking them to win the division again in 2011. 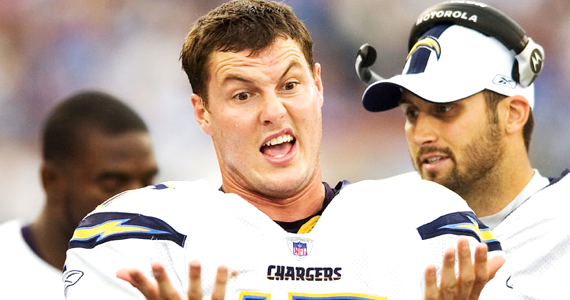 It all starts with Phillip Rivers (pictured above, looking confused as to why the Chargers only won nine games last year) at the helm of this powerful offense. Rivers is a beast (in the regular season anyway). Last year, he led the league in passing yards (4,720) and threw 30 TDs with only 13 INTs. Unlike last year, he’ll have Vincent Jackson to throw to for the first ten games of the year. This could prove troublesome for the rest of the division. When Vincent is covered, Rivers can go to guys like Malcom Floyd (717 yards in 11 games last year) or Patrick Crayton (514 yds, 9 games). Did I mention he has arguably the best tight end in the league on his list as well? Antonio Gates is back and healthy. Despite being limited to ten games last year, Gates still had 782 yards and 10 TDs last season. He is a beast. At running back, the Chargers have a couple of options. First comes Ryan Matthews, a 2nd year player who showed flashes of brilliance in an otherwise decent rookie season in 2010 (678 yds, 7 TDs). If he falters, like last season, the Chargers can turn to Mike Tolbert, who picked up Matthews’ slack last year with 735 yards and 11 TDs. The San Diego D, meanwhile, ranked 11th according to Yahoo fantasy sports last season. That’s a little deceiving, as ESPN has them ranked #1 in real (not fantasy) value. They’ve added several weapons on D this year (Takeo Spikes, rookie Corey Liuget and Bob Sanders), so they should be ranked very highly again in 2011. My Prediction: 12 wins… this team is too talented to not win this many, but they’ll have to avoid letdowns like getting swept by the Raiders again. Fantasy Notables: QB Phillip Rivers, RB Ryan Matthews, WR Vincent Jackson, WR Malcom Floyd, TE Antonio Gates, Defense. Fantasy Sleeper: Mike Tolbert. If needed, Tolbert will step up. A repeat of his 11 TDs in 2010 is not out of the question. Fantasy Poison: Nobody… barring injury. Jamaal Charles was the breakout star for the Chiefs in 2010. Last year the Chiefs were a bit of a surprise, topping the division with ten wins after losing at least twelve games the three previos years. Matt Cassell may have had a great year at QB (3,116 yds, 27 TDs, 7 INTs), but Jamaal Charles really carried the load for this offense. 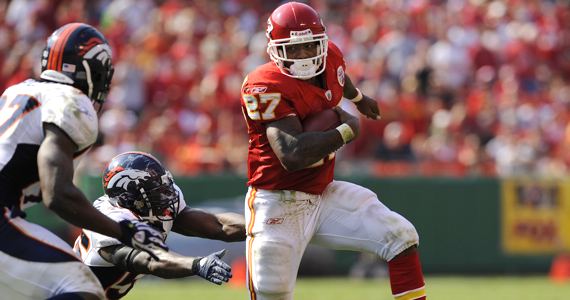 Charles’ 1,467 yards were good for 6th all-time for the Chiefs and, although his five TDs were a low total (probably because Cassell is selfish in the red zone), he was still one of the top running backs in the NFL. He even chipped in 468 yards and 3 receiving TDs! Also, don’t sleep on Thomas Jones and his 896 yards and 6 TDs rushing last year either. The Chiefs unrelenting running attack might take a bit of a hit this year, because the Chiefs added a couple of very solid receivers to go along with the spectacular Dwayne Bowe (1,162 yds, 15 TDs). Joining the ranks are former Cardinals Steve Breaston and Jerheme Urban rookie Jon Baldwin (think Plaxico Burress without a gun). Throw in 2nd year tight end Tony Moeaki (556 yds, 3 TDs), and needless to say, Cassell will have a lot of options this season. Defensively, the Chiefs have sack machine Tamba Hali (14.5 sacks to lead the league in 2010), and new personell on the line and at the line backer position could make them even more menacing for opposing QBs. They don’t allow many points (19.6 PPG), but will have to improve on their low turnover number (23) to be among the elites in the NFL. My Prediction: 9 wins… tough schedule this season (at Indianapolis, Chicago, New England and the Jets), so I predict a step back for the Chiefs, but they should contend for years to come. Fantasy Sleeper: Jon Baldwin – if he can be like Plaxico (on the field), he could have some solid fantasy value in 2011. Fantasy Poison: Jeherme Urban… is that supposed to be Jeremy? I think he’ll be unseated as the number two sooner rather than later. In 2010, McFadden finally began fulfilling the promise he showed in college. I don’t know if anyone noticed, but the Raiders won eight games last year! I hate to break it to you Raiders fans, but I don’t think they’ll repeat this in 2011. While the raiders young players finally started showing off their talents in 2010, they also had many breaks go their way, including beating the Chargers twice (twice!). Their QB last year was Jason Campbell, who played well in his 13 games (2,387 yds, 13 TDs), but he is not a game changing QB. While this means the Raiders can’t rely on him to carry the offense, he certainly won’t be a weakness for the team. The Raiders receivers are very young, but very very fast. Darius Heyward-Bey has to finally step in and show that he was worth that first round pick in 2009. Jacoby Ford (470 yds, 2 TDs) and Louis Murphy (609 yds, 2 TDs) should also be serviceable, but all three men will have to watch their backs, because rookie speedster Denarious Moore is knocking at the door. When the his speedy receivers can’t get open, Campbell can turn to ex-Giants tight end Kevin Boss (531 yds, 5 TDs). The Raiders will be carried by their running game. 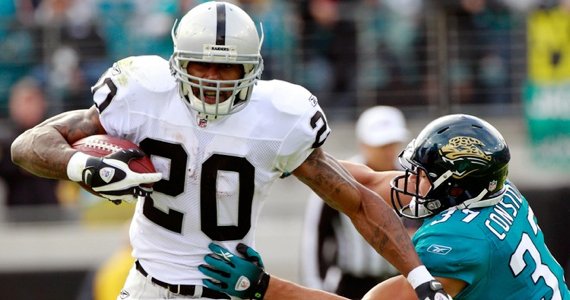 Darren McFadden was the #4 overall pick in the 2008 draft. in 2010, he finally showed why. His 1,157 yards were the most by a Raider since Napoleon Kauffman had 1,294 in 1997 (that’s 15 seasons) and he threw in 7 TDs to boot. He also had 507 receiving yards, which was good for second on the team. Add the talented Michael Bush behind him (655 yds, 8 TDs), and their 1-2 punch will serve them well. The defense returns most of their starters from 2011 (Asomugha is one notable departed), and so they should be alright for 2011. They give up too many points (23.2 PPG), but have otherwise solid numbers and will help you with lots of sacks and big plays. Fantasy Sleeper: One of the young WR will have to step up, but it’s hard to tell which one it will be. Fantasy Poison: Darius Heyward-Bey… he’s shown nothing his first two years in the league. I wouldn’t trust him. 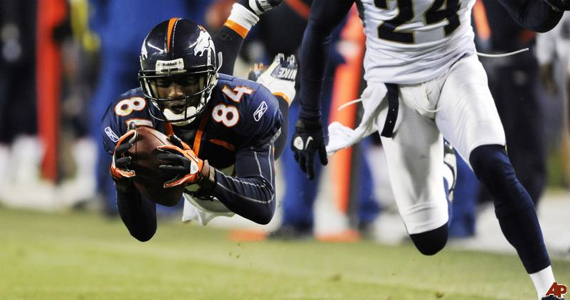 Can Brandon Lloyd repeat his incredible 2010 season under new coach John Fox? Last season, Kyle Orton put up some of the best numbers of his career (3,653 yds, 20 TDs) in the first thirteen games of the year. What did it get him? Benched. Once it was apparent that the Broncos were out of contention, they let Tim Tebow take the reigns (654 yds, 5 TDs). Rest assured that Tim Tebow is the QB of the future, but in 2011 it’s gonna be Orton. He’ll put up numbers before he gets benched when the Broncos fall out of contention. Then, at the end of the year, he’ll sign somewhere else and play. Orton will likely spend most of his time hooking up (hee hee) with WR Brandon Lloyd, who caught 77 passes for 1,448 yds and 11 TDs. It’s hard to imagine Lloyd doing this again, as the yardage was twice his career high, but he will still be one of the better deep threats in the league, so he’ll put up numbers. Eric Decker figures to be the second receiving option, a step up from his rookie year in 2010 when he was used rather sparingly (106 yds, 1 TD). He has the size and tools to put up some good numbers. In the slot will be return specialist Eddie Royal (627 yds, 3 TDs), who will provide a solid third option for Orton. The expected starter at tight end is new comer Daniel Fells from the Rams, but he might face competition from Dante Rosario. At running back, Knowshon Moreno (779 yds, 5 TDs) has all the talent in the world, but he has yet to fully tap into it. He could be poised for a breakout year under the new offensive system. If he struggles again, the Broncos have veteran Willis Mcgahee as well. Defensively, the Broncos were a complete disaster in 2010. Yahoo ranked them dead last, mostly because they allowed nearly 29 points per game and only forced 18 turnovers. This year, new coach John Fox is also switching to a 4-3, which might help. The addition of Von Miller, the best pass rusher in the NCAA last year, should help as well, but I’m not yet sold on this D.
Fantasy Sleeper: Eric Decker – The Broncos felt good enough about Decker to trade away Jabar Gaffney and his 65 catches for 875 yards. Decker will get his chance in 2011. Fantasy Poison: The Defense will probably be awful again…. stay away.